Jeff Puckett rushed for 224 yards to lead the Misericordia University football team to their first home win, 35-0, over FDU-Florham, Saturday afternoon at Mangelsdorf Field. Puckett ran for three touchdowns and passed for another as the Cougars improved to 1-2 and 1-1 in the MAC. Ryan Kurtz added a touchdown reception and 68 yards on the ground and Brandon Leap added a rushing TD. Rob Hart and Donald Bender led the Cougars with six tackles each and Tim Kelly recovered a fumble deep in their own end late in the fourth quarter as the Cougars recorded the first shutout in program history. The MU defense came up big early as the Devils started their first two drives inside Cougars territory, with the ball going over on downs both times. After a 53-yard punt to the Misericordia three-yard line late in the first quarter, Puckett led the Cougars a 97-yard scoring drive. Kurtz went off left tackle for eight yards and a first down at the 14 and then went up the middle for 10 yards and another first down at the 24. Puckett broke and picked up nine yards around left end for a first down at the 37 before Randy Custodio took a shovel pass 11 yards to the MU 48 to close out the first quarter. 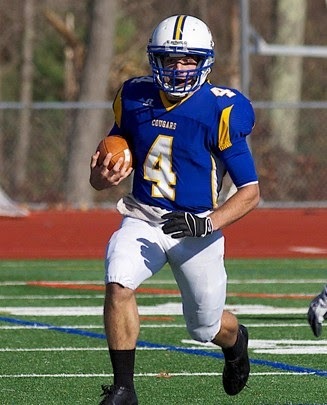 After moving across midfield, Kurtz went off left tackle for 12 yards and a first down at the FDU 35. Puckett raced around the right side for seven yards and a first down at the 17 and went 11 yards around the left end for to set up first and goal at the six. Puckett capped the drive with a six-yard gain up the middle to get MU on the board. MU forced a Devils' punt on the next possession and quickly moved 75 yards in just five plays to make it 14-0. On second and 11 from their own 25, Robin Custodio picked up 11 yards off right tackle for a first down. The Cougars moved to midfield on Puckett's 15-yard gain up the middle and he popped a run to the outside for 28 yards to the FDU 22. Puckett raced up the middle for a 22-yard TD with 5:08 left in the first half. With the Devils near midfield, Greg Zotian and Dom Picarillo combined for a sack of Tyler Maurer to set up second and 17 from the FDU 42 and an illegal block penalty backed the Devils up 15 more yards before the half expired. The MU defense stopped another fourth-down conversion attempt on the first drive of the second half and the Cougars took over on their own 37. Puckett raced up the middle for 23 yards into FDU territory and gained 27 yards on the next four carries to set up first and 10 at the 13. Following a penalty, Kurtz hauled in a 17-yard strike from Puckett on the right side of the end zone for a 21-0 lead with 12:42 left in the third quarter. Kevin Bagasevich broke up a pass on third down on the ensuing drive and the Cougars took advantage of a short punt to take over at the FDU 38 yard line. Puckett went off left tackle for 10 yards and Robin Custodio went around left end for eight yards. After Custodio gained 13 yards on the next three carries, Puckett went off left tackle and cut up field for a seven yard touchdown run and a 28-0 lead with 5:18 to play in the third quarter. Kurtz picked up 10 yards off right tackle for a first down at midfield and Puckett ended his day with a seven yard gain up the middle on fourth and four for a first down at the FDU 34. Two runs by freshman quarterback Brandon Leap moved the ball to the 21 and Leap eventually went up the middle on fourth down for a seven yard TD and a 35-0 lead with 8:30 to play. The Devils moved 70 yards inside the Misericordia 10 yard line, but the Cougars preserved the shutout when Tim Kelly recovered a fumble in the FDU backfield. Misericordia averaged 5.9 yards per carry for 368 yards on the ground while limiting FDU to 115 yards rushing. Patrick Newins a perfect five-for-five on extra point attempts. MU will travel to King's, Saturday.